March has shown some spectacular growth both in terms of crypto gains and new horizons. Join us as we share just a few of the big things we accomplished this last month. Are you new to the cryptocurrency space and looking to get the right direction on your investing journey? Are you a trader just looking to get more information on trading and analysis? Do you have a friend or family member that is looking to get into crypto? If the answer to any of these questions is “yes”, then we have something we would like to share with you. Our Introduction to Cryptocurrency Trading course is now LIVE. You have 24 hours to take advantage of a special offer as a reward for signing up for our newsletter. Hurry before this offer expires! We have officially partnered with Mudrex Exchange, an up-and-coming algorithm and automated strategy trading platform which allows you to configure strategies, follow others’ saved strategies, perform in depth backtesting and more to help hone your crypto trading edge! Expect to see educational content from us about the platform throughout the coming weeks. Sign up using our link to enter into a contest for a FREE month of Publications Package access, including lifetime access to Introduction to Cryptocurrency Trading. Winners will be announced both via blog post and Discord announcement on May 1, 2019. There have been some incredible cryptocurrency signals this past month and many members have seen a few instances of 100%+ gains. Is it altcoin season? Maybe it isn’t yet, but we clearly are continuing to see huge gains on our calls. 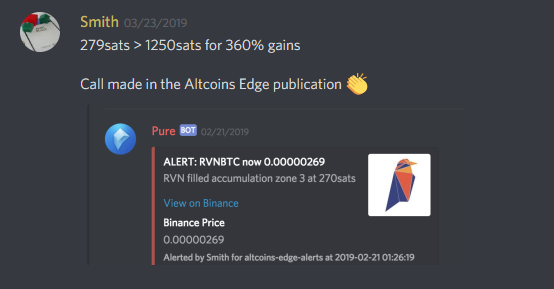 Altcoins Edge made a call over one and a half weeks and hit 260% of its first two targets. For those that decided to hold for three weeks, they were able to see profit of 360%. 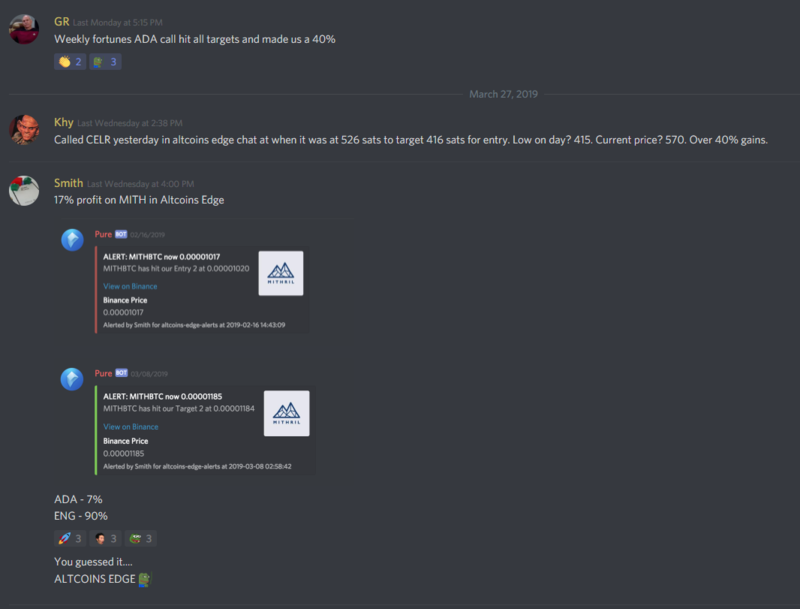 Another legendary call by Miles yielded 242% and potentially up to 280% profit on ENJ. This was available through both our cryptocurrency discord and free telegram channel. Finally, we have seen a huge amount of success with calls across all publications. There has been a major surge in the Publications Package group. 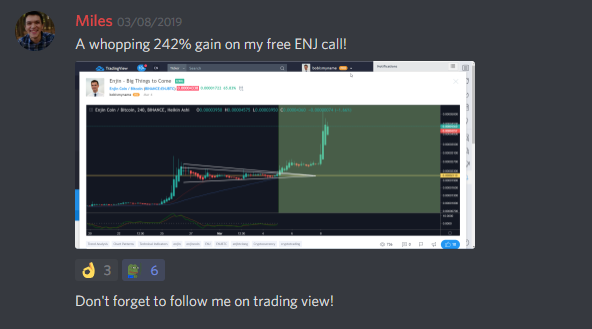 We had a few weekends where there were constant 30%+ gains every day, and members have been showing off their incredible gains in our discord server. 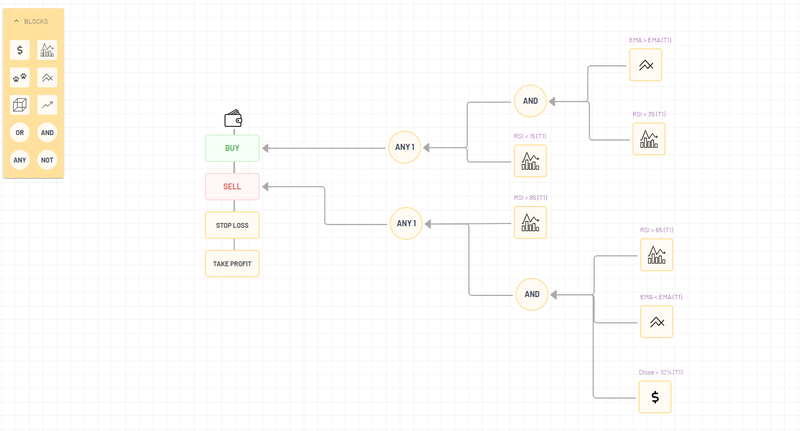 Check out the calls that have made profit this month!